Do you like to journal? Have notebook for everything? Looking for a new fun way to keep pictures, drawings, art and thoughts? Then this workshop is for you. In the 3 hour workshop Becky will teach you how to create this fabulous junk journal. You will learn how to create a cover from scratch, signatures with different papers, bags, pockets and more. You will gain the skills to bind the journal and add a leather spine. Junk Journals have been very popular for awhile but can seem overwhelming to create on your own. Becky has been designing and creating junk journals for years. Although when she started making them they did not have a fun name like junk journal. 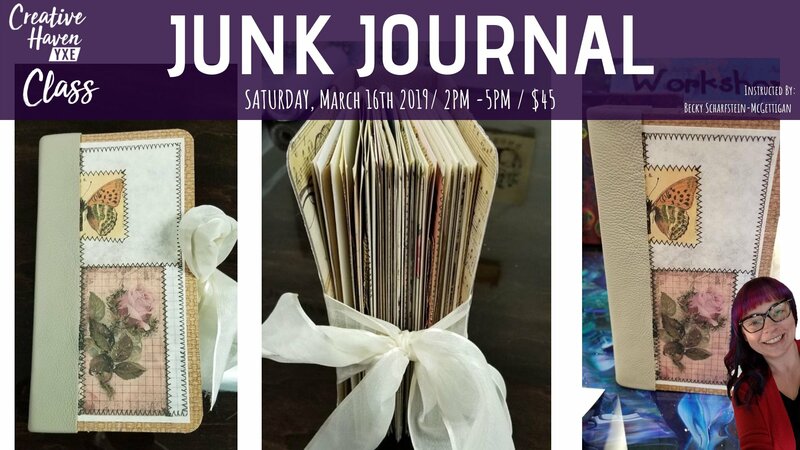 She will guide you through each step of the process to create your very own and give you the skills to create and customizes your junk journals. This workshop is great for beginner paper crafters and experienced paper crafters. You will gain some new skills that will transfer to all your paper crafting art.